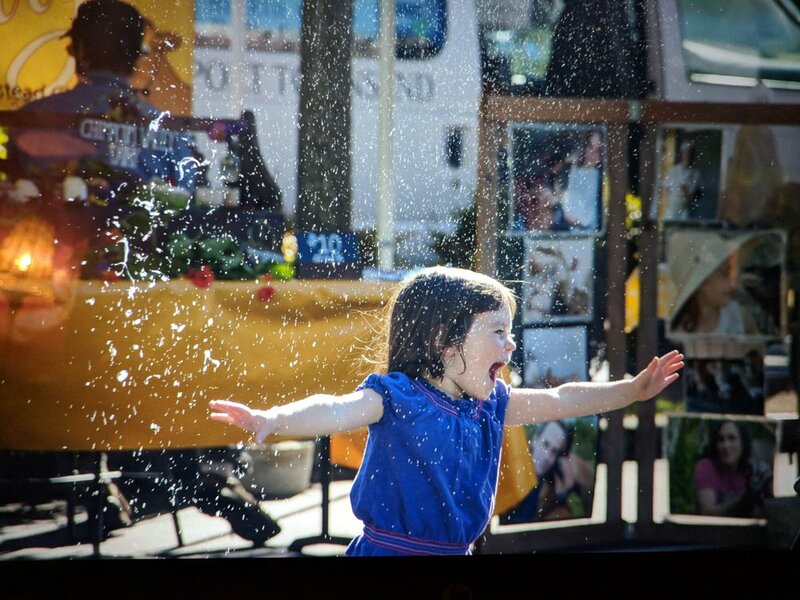 Bubbles and Inez at the closing day of the Port Townsend Wednesday Farmers Market. Photo by A Fare Story, Naomi Specht. It is blustery outside. Shorter days, more grey skies and rain are coming. However, at the Port Townsend and Chimacum Farmers Markets we are in a sweet spot. While winter squash has made its appearance at market, for a short time we still have locally grown watermelons, tomatoes, summer squash, and other summer treasures. I even found raspberries last Saturday from SpringRain Farm and Orchard. If you haven't tried them yet, local melons are fantastic this season. As summer fruit becomes more sparse at market, we are fortunate to have squash on the scene, and for this moment in time, we have both. Enjoy! SpringRain Farm and Orchard: It's Turkey Time! We are now accepting orders for Thanksgiving/Harvest Dinner time. Our turkeys are certified organic, live in our apple orchard, and spend every day outside doing their turkey thing. We charge $6.50 per pound and required a $20 nonrefundable deposit. You can submit your order online at http://www.springrainfarm.org/turkey-orders/ or come by the farmers market to do it in person. Chimacum Market vendor, Hurricane Hills Winery, now has their Apple Habanero wine available! Just in time for all of the apple celebrations happening this month, stop by the market and try it this Sunday. This wine is hand-crafted from apples grown at the winery, in addition to those gleaned from across the Olympic Peninsula. The apples are fermented with a special combination of spices and habanero peppers, creating a unique wine that has just the right combination of sweet and heat. Don’t let the habanero part scare you, spice aficionados have rated it at 2 stars or less. This is the perfect wine for fall, and can be enjoyed both chilled or warmed as a mulled wine. It pairs wonderfully with spicy foods, and is really fun to cook with! Some of our favorites include pork dishes, marinades, roasted carrots or to spice up a stir-fry. Cheers! Red Dog Farm has some new fall crops making a debut this weekend: celeriac, parsnips, and shallots. We are in the thick of our winter squash season. Everything is ripening nicely and we even got a light frost to bring out the sweetness! Our abundance of other fall favorites rounds out our offerings- spinach, carrots, beets, celery, potatoes, and kales. It’s officially soup season! New vendor, Neve Wear, is joining us this Saturday at the Port Townsend Farmers Market with repurposed fashion. Artist, Kelle Ronnfeldt, has been sewing clothing since she was 12 years old, preferring her own creations to what she could find at stores. She writes, "I offer one-of-a-kind wool/cashmere skirts, ponchos, and accessories made from up-cycled, 100% natural fibers. I try to incorporate found objects whenever possible- buttons are my favorite." Kelle is only joining us for a couple of markets this season. Visit her booth this weekend to check out her clothing. You can also see her work here. Finriver Cidery is hosting a Harvest Dinner fundraising event on Thursday, 10/25 in support of the farm-to-school programs at the Port Townsend and Chimacum schools. Crystie Kisler shares, "This event builds on many, many years of hard work by many people and coalitions to support food service improvements in the schools and grow the positive connection between kids, nutrition, gardens, and the local agriculture community. Thanks to all of you for your past and continuing efforts to feed kids well and to grow healthier community!" Learn more and get a tickets here. Time has flown away with the fall breeze. October is here and we only have four more Chimacum Farmers Markets this season as well as only four more Power of Produce (POP) Club dates. Take advantage of our two local farmers markets over the next month to stock up on locally grown food and learn and play at POP Club. While we have a handful of overlapping vendors between the Port Townsend and Chimacum Farmers Markets, we also have many vendors who only participate in the Chimacum Farmers Market. Check out the Chimacum Farmers Market for hand-made soap by HoneyHoney Soap, fruit wine by Hurricane Hills Winery, belts and suspenders by Scarlett Leather, silver and gold jewelery by Pacific Grove Jewelery; tinctures, salves and body care products by Advantgardenz; fresh flowers by Sweet Seed Flower Farm and Dietrich Farms; pork from Egg and I Farms; and fresh produce from Les Richards. You don't want to miss these great vendors! On Saturday, October 6th, United Good Neighbors’ Annual Campaign, Give Jefferson, will be hosting a Nonprofit Fair. The fair will take place in the Port Townsend Community Center, immediately adjacent to the market. Check out the diverse array of Jefferson County nonprofit organizations! Over 50 local nonprofits will be represented, showcasing the fantastic work they do for our community. The Jefferson County Farmers Markets are one of the Give Jefferson beneficiaries for our food assistance matching programs. Visit the Nonprofit Fair to learn more about all of the great work nonprofit organizations do in our community.